After reading Rework from the 37signals.com, I could not wait to also read Getting Real. Getting Real is another practical and inspiring read. After reading Rework from the 37signals.com, I could not wait to also read Getting Real. I was not disappointed, it is another practical and inspiring read. This book was actually published before Rework, so some of the ideas were a repeat of things also mentioned in Rework. True to there own philosophies of leaving out everything possible, the book is relatively short and broken up into short chapters with mini chapters sometimes added. Throughout Getting Real the authors supplement the book with inserts from other people reinforcing the point they are trying to make. It was great reading somebody else articulating the idea a little differently. Getting Real is all about taking action rather than talking about taking action. It is about not writing documents about what you are going to do and just doing it and learning as you go. One of the fundamental ideas behind this philosophy is that many of the problems you anticipate will happen never will. So stop worrying about them and get going. Then solve the problems that do occur in a JIT (just in time) manner. 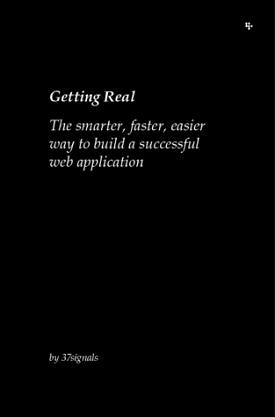 The book applies the Getting Real way of thinking (or doing) to almost all aspects of getting a web application going. This includes interface design, feature selection, coding and promotions among many others. It ties in very nicely with the Lean Startup methodology. I suspect some of the ideas in the book will help when I get to start my next business. Most of the idea would have already come in handy if I had read the book a few years ago. I think I would have approached many conversations and discussion we had at Private Property in a different way if I had read it back then. This entry was posted in Book Reviews, General, Reviews on 2013/02/04 by Justinus.